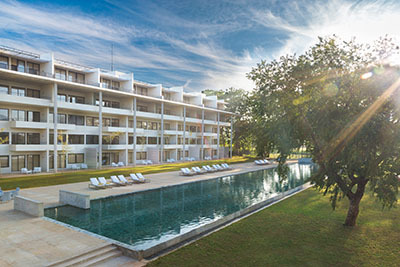 Bringing in an age of true Sri Lankan hospitality to the Cultural Triangle is Jetwing Lake with its contemporary design and modern comforts. Nestled in a rustic setting, the 18-acre property opens out to panoramic views of Dambulla. The all-new Jetwing Lake is five kilometres away from Dambulla town, tucked away amidst a setting of foliage sheltering the stylishly designed resort, and is in close proximity to heritage sites and places waiting to be discovered. The 94 rooms painted in warm earthy colours add to the surrounding, and are equipped with luxury shower areas overlooking the panorama, a sitting area, satellite TVs, Wi-Fi, air conditioning and king-size beds.